High schools throughout the country have recently seen a considerable increase in the student use of electronic cigarettes and/or vaping pens. At Secaucus High School, we take this issue seriously due to the negative health effects vaping can have on our students and want to make parents and guardians aware of the risks vaping can have on a person’s health. According to the Center for Disease Control and Prevention, nearly 1 out of every 4 high school students use electronic cigarettes or vaping products. Common additives used in electronic cigarettes include nicotine and caffeine which when found in high doses can have negative effects on adolescent brain development. Nicotine exposure during adolescence can impact learning, memory, and attention. The aerosol that users inhale and exhale from e-cigarettes can expose them to harmful substances including heavy metals, volatile organic compounds, and ultrafine particles that can be inhaled deeply into the lungs. It can also increase the risk for future addiction to other drugs. Recently, a new type of e-cigarette has become increasingly popular among our nation’s youth due to its minimal exhaled aerosol, reduced odor, and small size. May of these new devices look like USB flash drives and are called JUULs. 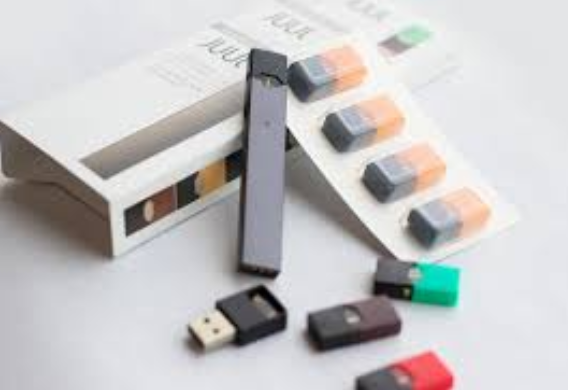 All JUUL e-cigarettes have a high level of nicotine and a cartridge or “pod” contains as much nicotine as a pack of 20 regular cigarettes. Given the uncertainty of what substances are contained in these devices and to ensure the health and safety of our students the Secaucus High School administration will continue to take the necessary steps when students are in possession of or are found to be using an e-cigarette or vape related item. Students who are discovered to be in possession of or are found to be using an e-cigarette or vape related item on school grounds or at a school sponsored event will be immediately referred to the Principal or other designated school official in accordance with our district’s Substance Abuse Policy and Regulation 5530, Student Smoking 5533 and will be referred for an immediate medical examination. We encourage you to review this policy, as well as our Student Code of Conduct and the disciplinary consequences on our school’s website. We will be hosting a family night to educate our parents/guardians and students on this topic on January 15, 2019 at 6:30 pm at the Performing Arts Center of Secaucus High School. Please see our flyer on the corresponding webpage. It is our hope that through efforts of home and school, our students will refrain from using such devices. We strongly encourage you to have a conversation with your child of the dangers of e-cigarettes. Thank you for your anticipated cooperation and please feel free to contact me with any questions or concerns. An excellent resource that offers a “Parent Tip Sheet” in both English and Spanish. Please check out the “Take Action” tab and “Additional Resources” tab for reports, statistics, videos, and family tips. This resource, sponsored through the Center for Disease Control and Prevention, offers insight on how to approach a conversation with your child about vaping and its harmful effects. A public health insider blog from Seattle, offers information from author Carly Thompson on how parents can prevent their children from becoming addicted to nicotine. This resource provides images of vapes and shows everyday food items that have been marketed as e-liquids for e-cigarettes and vape related items. Through Partnership for Drug Free Kids, this resources explains what vaping is, what a vape looks like, what is being vaped, and what we can do to stop it.